I've never heard a bad thing about Colorado. And now, after spending a few days there, I understand why. I've actually been to Denver before, nearly 10 years ago, as part of a road trip with my family. We went to Elitch Gardens Theme Park. Beyond that, I hadn't really ever seen Denver or explored Colorado much. My boyfriend and I had been keeping our eyes open for cheap flights for a few months. Finally, in September, we found a great deal for Denver, Saturday to Tuesday. Though not too long of a trip, it gave us nearly three full days and required minimal time off work, which was a plus. Much of Saturday did not go as planned. Our flight was delayed two hours, changing our arrival time to a half hour after our rental car place closed. During the delay, we had to make a few phone calls to change our pick-up reservation to Sunday morning. Landing in Denver with no car to pick up meant relying on Lyft rides to get us around. Still, we rolled with the punches and didn't let it keep us from enjoying the day. Our first stop after arriving in Denver was our Airbnb, to drop off our stuff. This was my first time using Airbnb, and surprisingly, it was an A+ experience. I say "surprisingly" because I was pretty skeptical about it going in. Even though it's a cheaper option compared to hotels, I felt a little uncomfortable about the idea of staying in someone's home, especially because we were only renting a room. The host would still be there. The whole thing not only exceeded expectations, but was better than I could've hoped. And actually, we never even met our host! We seemed to have opposite schedules – by the time we were up in the morning, she was already gone, and was still out when we would come home. We were given access to a spare key, so we were able to let ourselves in the apartment whenever we needed it. Along with our private bedroom, we also had a bathroom to ourselves, stocked with shampoo, conditioner, lotions, and other amenities. There was a welcome binder in our room with information on public transportation and things to do/see, and a bunch of snacks left out for us in the kitchen. To walk into a stranger's home in a new place and feel at ease was comforting. Even though we were in a new state, it still felt like we were at home, in a way, because we were in a home. I'm sure that has some kind of subconscious effect on you too – lowering stress levels and making you more relaxed. After settling in to our Airbnb, we headed to downtown Denver. Living in the Chicago suburbs, downtown Chicago is the norm for me when it comes to city life. That's what I'm used to, and it's what I imagine all cities to be like, which just isn't accurate. Because as you could probably guess, Denver is much different than Chicago. First of all, it's four times smaller. Chicago is the third most populous city in the U.S. Secondly, drivers are much less aggressive in Denver. I don't think I heard a single car honk the entire time I was there (and if you're familiar with Chicago, you know that it's impossible NOT to hear a car honk). That's what I noticed, and enjoyed, the most. It's quaint. It's quieter. There's a stretch of road that's for pedestrians and bikers only – no cars. The area was also pretty lively Saturday night. A lot of places had bands playing music, either inside the building or right outside. This could've been extra fun for Great American Beer Festival, a three-day fest that we realized was ending that night. Or maybe Denver is always that cool. Sunday was our first full day, so we made it an early one and a long one. We picked up our rental car by 9 a.m. and immediately drove to Lookout Mountain. Two of our Lyft drivers recommended it as a must-see spot because of the view you can get of the city. While Denver is known as The Mile-High City since it's one mile above sea level, the surrounding areas are actually even higher, putting Denver in a sort of bowl. Lookout Mountain is a popular place to hike to overlook all the buildings. Full disclosure: We didn't exactly get that. We either hiked the opposite direction, or we didn't hike far enough in the right direction. Our view was the trees and mountains. But I'm not complaining. I like that better anyway. There were a surprising amount of bikers on the trails too. The paths were pretty rocky, and steep in some places. Just watching the groups zip by made me nervous. After tackling Lookout Mountain, we drove about 20 minutes to Golden for lunch and a (free) tour at Coors Brewery. I'm not a beer drinker, but it was still pretty cool. The tour is self-guided, and you get a few free drinks at the end. Our next hiking destination was Eldorado Canyon State Park. We arrived in the evening, about an hour before sunset. There were a handful of hiking trails to choose from, but honestly, you can't go wrong. No matter where you go, it's going to be beautiful. Guaranteed. We hiked about an hour one way, watching the sunset behind the peaks. We were so mesmerized by our surroundings that it didn't feel like we'd been walking for that long. We kept saying that the mountains looked exactly like the default Mac desktop background. The fact that you can drive less than an hour away from the city and be immersed in trees and mountains is incredible. It's two different worlds so close to each other. Monday was our day for sightseeing. We started with The Source in River North (which is referred to as "RiNo." Why doesn't Chicago use that?). 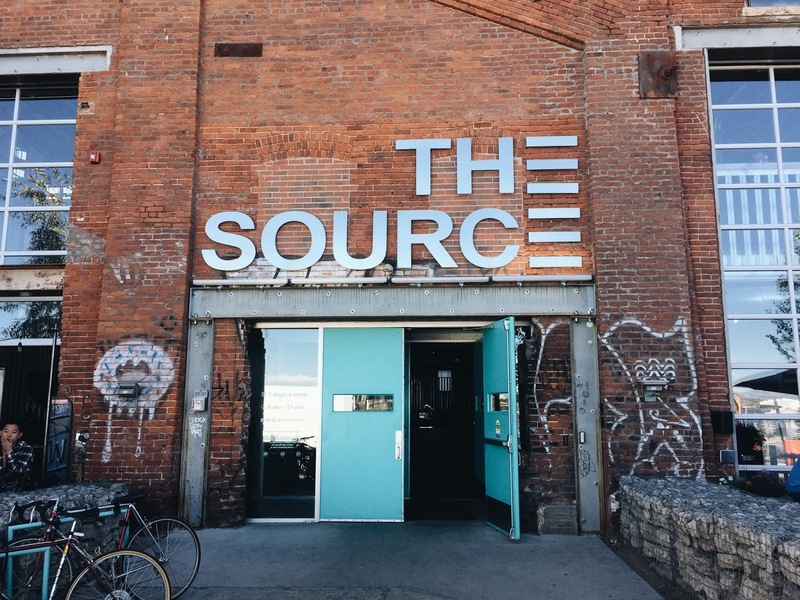 The Source is a food market located in a brick warehouse. There's coffee, a bakery, a butcher shop, sandwiches, and more. It was another common recommendation from our Lyft drivers, though you probably wouldn't guess from looking at the front of the building that it was such a popular destination. 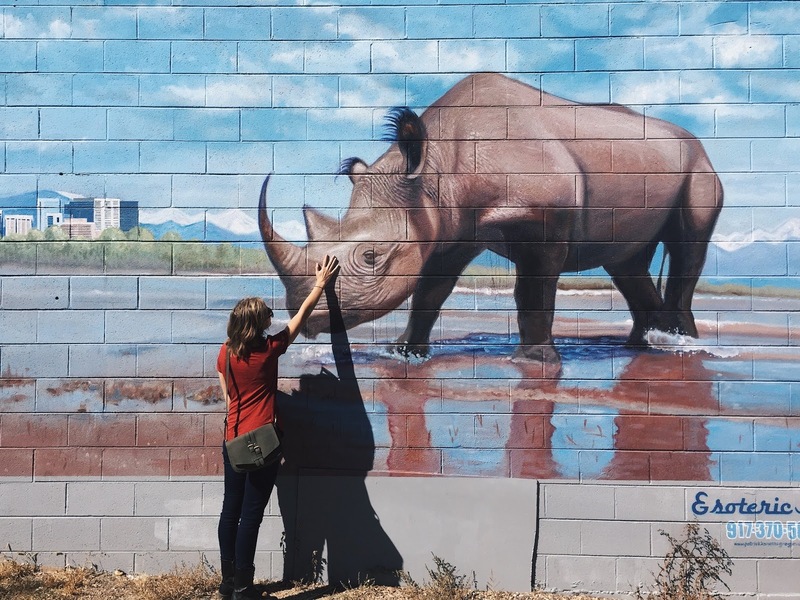 The afternoon was spent walking around RiNo looking at street art, visiting the Denver Museum of Nature and Science, and then admiring City Park next door (so pretty, as if you couldn't already guess). As our final full day winded down, we made our way back to downtown for our last meals: sushi burritos (!!) and a rattlesnake and pheasant hot dog (?!). I've been wanting to try a sushi burrito since I first heard such a thing existed, back in high school, when the only location I could find was in San Francisco. Now, there are two locations closer to me, in Chicago, but I let Denver be my first. Worth it. This trip was definitely one to remember. It's amazing how much you can do in just three days. Not only that, but it didn't feel like a lot at the time. We didn't feel rushed. It was the perfect balance between knowing what we wanted to do and just winging it.